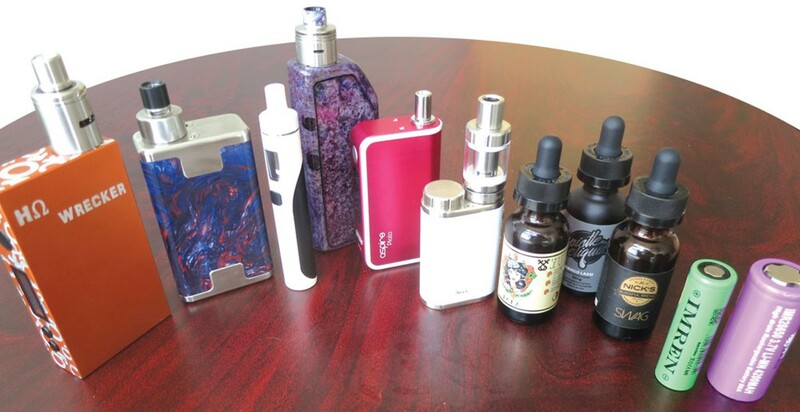 Vapers have many choices beyond simple e-cigarettes, including these vaporizers shown here with "e-juice" and batteries. The main difference between regular and e-cigarettes is all the tar-based junk in tobacco smoke, including 400 toxic chemicals and 43 carcinogens such as arsenic and formaldehyde. While the nicotine keeps users addicted, it's the tar that kills. According to the World Health Organization, smoking will kill a billion of us by the end of the century, plus another 600,000 people a year who inhale secondhand smoke. In the U.S. alone, nearly half a million people, most of whom are relatively poor and less educated, die of smoking-related illnesses each year. Not only are e-cigarettes and the larger vaporizers less harmful, but they also help smokers quit. John Britton, lead scientist of the report and director of the U.K. Center for Tobacco and Alcohol Studies, claims that "e-cigarettes have the potential to help half or more of all smokers get off cigarettes. That's a huge health benefit, bigger than just about any medical intervention." The report notes that would-be quitters have a 50 percent greater chance of success using e-cigarettes than with nicotine patches. The U.K. recommendations haven't come unchallenged on this side of the Atlantic. Stanford researcher Stanton Glantz, a notorious anti-smoking crusader, claims that e-cigarettes will lead to nicotine addiction in young people who wouldn't otherwise take up smoking. "These guys, in my view, are going off a cliff," he told the New York Times. "They are turning England into this giant experiment on behalf of the tobacco industry." The controversy over e-cigarettes appears to be between the health of tobacco addicts now and the future potential harm to those who would otherwise abstain from nicotine products (echoing, perhaps, the debate over needle exchange as a public health measure). It seems that smoking the leaf of Nicotiana tabacum has always had its detractors. In 1604, just 20 years after Walter Raleigh introduced tobacco to Britain, King James I offered his judgment on the new pastime: "Have you not reason then to bee ashamed, and to forbeare this filthie noveltie?" he asked, describing smoking as "A custome lothsome to the eye, hatefull to the Nose, harmefull to the braine, dangerous to the Lungs, and in the blacke stinking fume thereof, neerest resembling the horrible Stigian smoke of the pit that is bottomelesse." With today's ready availability of nicotine-based vapor in e-cigarettes and vaporizers, James' spirit may have peace at last; the tobacco era could be coming to an end. Barry Evans (barryevans9@yahoo.com) totally enjoys his one cigarette a year at Thanksgiving.